As of November 25, U.S. gasoline inventories reached 226.1 million barrels, a 9.3 million barrel increase from the same time last year and the highest level for this time of year since at least 1990. Gasoline inventories have been elevated all year despite strong domestic consumption and exports. 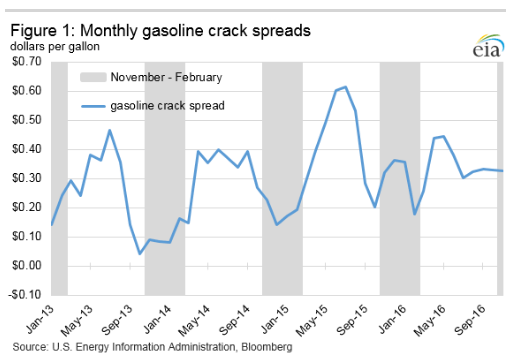 High gasoline crack spreads, the difference in value between a gallon of gasoline and a gallon of crude oil, have encouraged continued high utilization of U.S. refining capacity. The fall refinery maintenance season had less down-time compared with last year, helping to further drive high levels of production and inventory. Consumption of gasoline in September, the most recent monthly data point, set a record high for the month at 9.5 million barrels per day (b/d), 203,000 b/d higher than the previous September record set in 2015. Weekly product supplied data indicate that strong demand for gasoline continued into the fall, with the second week in November setting a new high of 9.4 million b/d of finished motor gasoline product supplied compared with 9.1 million b/d at the same time last year. Crack spreads in the U.S. have remained relatively high despite a typical seasonal decrease. The New York Reformulated Blendstock for Oxygenate Blending (RBOB) to Brent crack spread dropped from 47 cents per gallon on November 1 to 25 cents per gallon on November 18. While rapid, this decline is common around the November timeframe and, relative to recent years, crack spreads remain high for the season, providing incentive for refineries to run (Figure 1). The average New York RBOB to Brent crack spread through mid-November 2016, 33 cents per gallon, is the highest dating back to at least 2009 and is greater than spreads for all of November in 2015 and 2014 by 1/2 cent and 10 cents, respectively. U.S. refinery and blender net production of finished motor gasoline was 10.3 million b/d in September, 303,000 b/d higher than the previous September. Refinery output remains strong even in the late fall; the first two weeks of November had a net output of 10.5 million b/d and 10.2 million b/d, respectively, compared with output of 9.7 million b/d and 9.6 million b/d for the same weeks last year. Gasoline prices are closely linked to crude oil prices, with both relatively low compared with recent historical levels. The Cushing, Oklahoma, West Texas Intermediate (WTI) spot price on November 21 was $47.48 per barrel (b), above the November 2015 average of $42.44/b. However, this was well below the previous three-year (2013-2015) November average of $70.70/b. U.S. gasoline prices follow a similar pattern; the price for U.S. regular gasoline was $2.15 per gallon as of November 28, up 10 cents from the same time last year. However, 2016 prices for U.S. regular gasoline are still relatively low compared with the November average of $2.77 per gallon for the previous three years. In addition to strong domestic gasoline demand, exports have also been high. September 2016 exports were 564,000 b/d, up 208,000 b/d over the year-ago level. The Gulf Coast (Petroleum Administration for Defense District (PADD) 3), accounted for 92% of total U.S. gasoline exports in September of this year. The bulk of U.S. exports go to Mexico, which alone accounted for 60% of total U.S. motor gasoline exports in September. Beginning in late August, 2016, EIA’s Weekly Petroleum Status Report began publishing weekly petroleum export estimates based on near-real-time export data provided by U.S. Customs and Border Protection. 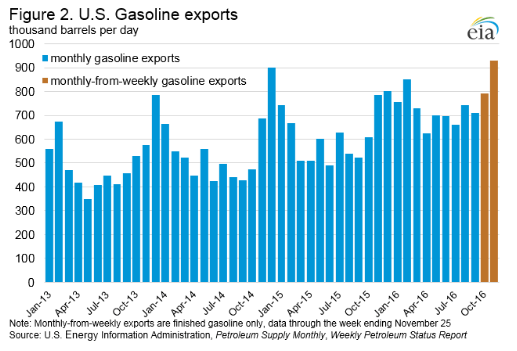 U.S. gasoline exports have increased rapidly between September and early November. While weekly gasoline exports have declined sharply over the past several weeks, they remain well above monthly export levels since 2010 (Figure 2). The U.S. average regular gasoline retail price fell less than one cent from the previous week to $2.15 per gallon on November 28, up nearly 10 cents from the same time last year. The Rocky Mountain price fell four cents to $2.15 per gallon, while the West Coast price fell two cents to $2.57 per gallon. The East Coast and Gulf Coast prices each fell one cent to $2.16 per gallon and $1.91 per gallon, respectively. The Midwest price increased nearly three cents to $2.04 per gallon. U.S. propane stocks decreased by 1.9 million barrels last week to 100.8 million barrels as of November 25, 2016, 3.3 million barrels (3.2%) lower than a year ago. Gulf Coast and Rocky Mountain/West Coast inventories decreased by 1.8 million barrels and 0.3 million barrels, respectively, while East Coast and Midwest inventories each increased by 0.1 million barrels. Propylene non-fuel-use inventories represented 4.4% of total propane inventories. As of November 28, 2016, residential heating oil prices averaged nearly $2.40 per gallon, just over one cent per gallon more than last week and almost four cents per gallon higher than last year at this time. The average wholesale heating oil price is almost $1.59 per gallon, nearly four cents per gallon more than last week and 16 cents per gallon higher than a year ago. Residential propane prices averaged nearly $2.08 per gallon, almost two cents per gallon more than last week and about 11 cents per gallon more than one year ago. Wholesale propane prices averaged $0.64 per gallon, two cents per gallon more than last week and 14 cents per gallon more than last year’s price.